Don’t get me wrong! I loved every teeny tiny minute of my visit back to North America. I got to spend lots of quality time gardening with Corie, cooking with Caity, and watching baseball with Danny! We had many wonderful family dinners from Cotijas in front of the Padre game on TV! We even took in a couple of games ourselves and Caity and I cheered at the ever so lively Bobby Sox slow pitch games that both Corie and Danny play for. Six weeks at home also allowed me to fly to Vancouver and to Denver and stay in the magnificent new homes of Mark & Wendy and Ken & Taylor as well as do some hiking in some of the most spectacular mountains of the world! Lots of extended family visiting, BBQs, beach time, sweet visits with friends and that ever so satisfying task….shopping for boat parts! The quintessential Perfect Summer! I wasn’t really ready to say good-bye as Corie dropped me off at SAN for my 30 hour flight back to Phuket, but you know, when you stay with family (even if it’s in your own house) it’s better to leave a day too early than a day too late! Also, Neal had been a real prince about me going off by myself to get my dose of home, family and friends and I didn’t want him to completely forget about me! I heaved up my two 50-lb bags full of boat parts and took a step from one world into another. It’s pretty amazing how adaptable is the human species. Grumble as we might about change, when it comes- we deal. My advantage here is that after already living in Thailand I have begun to know some of the ropes. You never know ALL of the ropes because it’s very different and well…they change a lot! However, after descending off my Air Korea flight and entering the packed shoulder to shoulder, chaotic, full of Korean tour groups Thai Immigration room, I knew that there would be somewhere…..a very short line! Five minutes later, after skirting the back wall, stepping over piles of carry-ons and ducking behind a sign behind a potted plant, I paid my baksheesh and my visa was stamped! 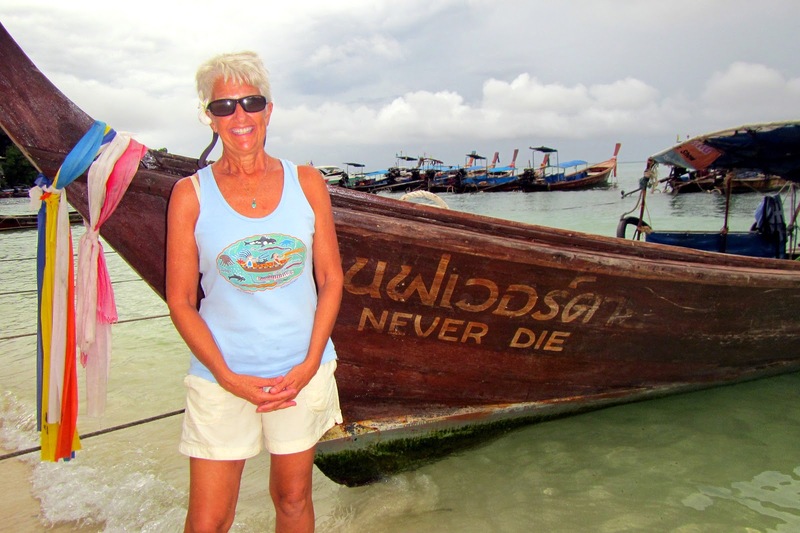 Oh yeah….I remember now…..
From there on and over the following week the unusual things that I had missed about Thailand came flooding back to me. 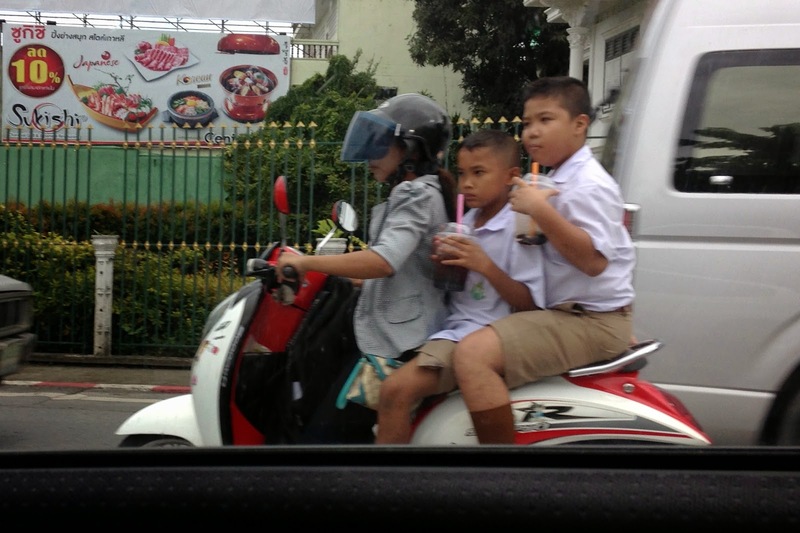 Good or bad, this is the way things are: Four young kids in school uniforms zipping home on one motor bike. Chirping geckos on the walls of the open air restaurants. The sweet, moist smell of the jungle at night. Traffic (motor bikes and small delivery trucks) driving the wrong way down the highway. Knowing when the current is slack because the fish swim in circles instead of up current. 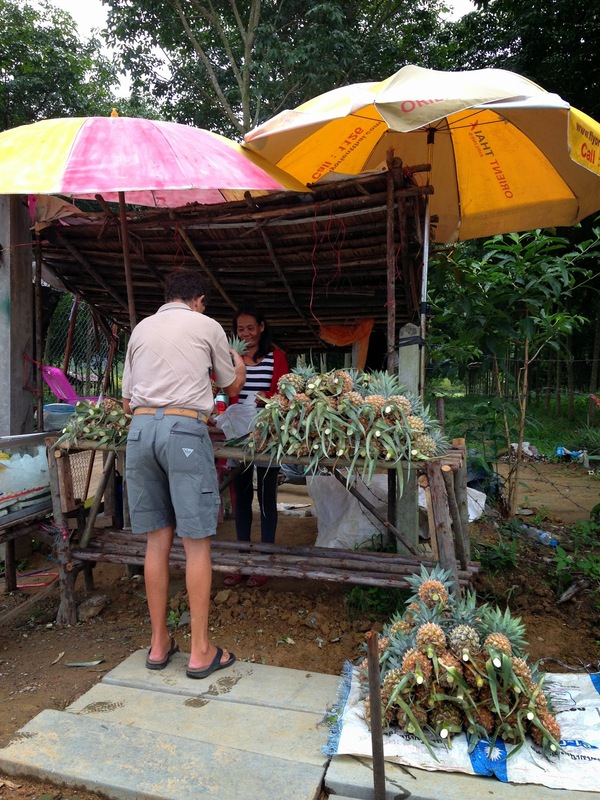 Buying pineapples at the stands on the side of the highway. Piles of flip flops outside of every restaurant and shop, including the chandlery. Eating dinner family style at Coconut’s with a kid who grew up in Sri Lanka and a Kiwi who told a story about spending the night in a thermal pool while lost one New Zealand winter night. Not being able to buy booze between the hours of eleven am and five pm, unless you are buying a lot (cases). And lastly, living on a boat in Phang Nga Bay- always in motion, knowing when the tide is high or low, being awakened by the long tail fishing boats, feeling connected to the sea. A friend recently asked me what I have learned while traveling. Fair enough, I said while trying to come up with a meaningful answer. In thinking about this question since, I think the answer comes in what I have unlearned. I have unlearned that there is only one way to do things, only one way to measure success, only one way to define values. I have unlearned that bigger is always better and that busy is always fulfilling. I have unlearned that the small things are not as important as the big things. What I have learned though, is that relationships span time and distance. That people everywhere love their children. That no matter where you travel, you can always find a kindred spirit. That the world is full of good food and good company. That “different” holds no value judgment. And that whenever you leave any place behind, there will always be something you will miss.